Developers aren’t mind readers. Incomplete information and poor communication can derail a project before it begins. 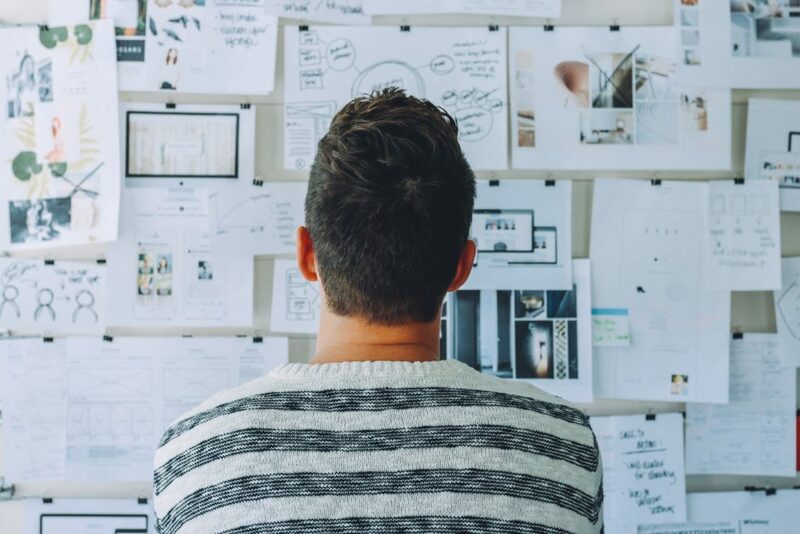 Before approaching a developer, you want to have the essential pieces of your app idea together to give your idea a chance to blossom into a great application. This application development checklist ensures that you’re prepared to give your application the best rollout possible.Learn from this essential guide and develop a good report with your developer. Make sure you’re on the same page, and together you’ll create the best version of your idea. Embracing the concept of a Minimum Viable Product (MVP) is one of the keys to a successful application development project. Validate the basic use of an application for its intended users before launching the user-untested application into the market. Rather than building an application with all the bells and whistles at the start, focus on developing something simpler that fulfills your application’s baseline functionality. Knowing your MVP will avoid building a product that is unnecessarily feature-heavy, and allow for some agility in adding or adjusting functionalities as your app goes through different iterations. Read The Lean Startup for how to cost-effectively develop a product and optimize its launch. I also recommend taking a good look at Launch Academy’s “Startup Growth Road Map” infographic that has more helpful resources. Put your ideas into writing. At a bare minimum, you should have a bullet point summary of what your application does. If you have a crystal clear image of what your application does, and what it would look like, wireframing is an excellent exercise to communicate your vision. A wireframe is like a storyboard of your application. Each panel consists of a mock-up that illustrates what users would see and experience as they navigate through the application. In the early stages, you can quickly create wireframes as rough sketches on paper and scribbles on a whiteboard. There are also wireframing tools available online for more sophisticated and interactive wireframing. With bullet point user stories and perhaps wireframes in hand, you’ll find better success at communicating your app idea to developers. 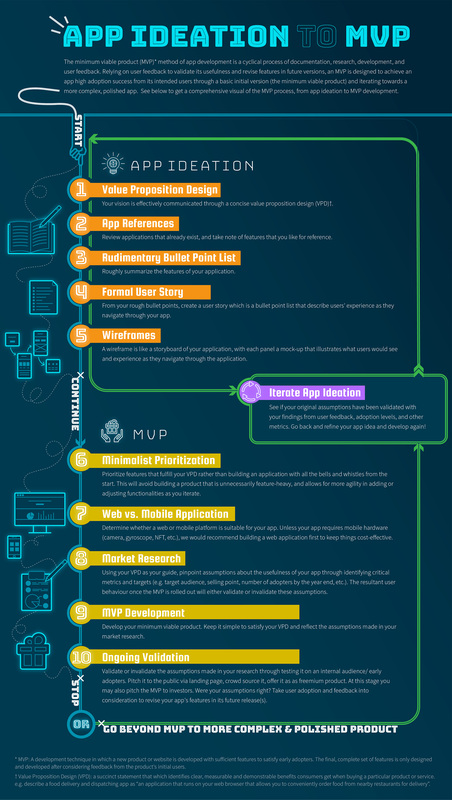 Do see our App Requirement Best Practices: From Ideation to MVP infographic to get a more detailed grasp on documenting app requirements. Let’s face it, novel app ideas are a rarity in the app world. Apps were either developed in parallel to similar applications, or are somewhat of an iteration of apps that existed before them. When approaching a potential developer, it’s good to reference existing applications to illustrate your app idea. Now you’re thinking, “All of this sounds great, is there anything else I should consider before consulting with a company about my project? There it is! Glad you asked! Here are more topics to think about before you consult an app developer. Frankly, ideas aren’t that valuable. Unless you’re an established company an NDA brought at the outset can be a sign of off-putting amateurism. Some developers will charge a fee or outright refuse to sign an NDA at the very start as it reeks of distrust. It may also contain clauses that are difficult (if not impossible) to follow. Reputable developers will abide by ethical business practices. They won’t steal technology or sensitive data. Promising to secure an intangible idea is not something they can always do— they’ve probably heard it and/or have developed similar technology. As virtually no idea is thoroughly original, an NDA can put developers in a bind. Ideas build upon the ideas that came before it. It isn’t realistic to expect your idea or feature to be unique. The truth is that your idea has likely been seen and implemented across different platforms. If you’re still in the stage of funding your application, please do not ask investors to sign an NDA as you will be laughed out of the room. Investors have zero time to steal and facilitate projects themselves. They likely also deal with plenty of pitches that resemble your own. However, there are circumstances that merit including the litigious document. When appropriate, do take along a drafted non-disclosure agreement to protect your company’s intellectual property and peace of mind. An NDA has a time and place. You can read about it in our blog post here! Web applications are hosted on servers and accessed via a web browser to use on both desktop and mobile devices. Mobile applications are downloaded into our phones and are generally distributed at an app marketplace. Starting with a web application that is usable across different devices is often the more cost-effective way to begin your application. No well-established freelancer or development agency will work for free or for a share of equity because of your million dollar idea. Don’t let the absence of a sizable budget deter you. Instead of contacting developers right at the start, consider finding a co-founder with the knowledge and credibility that can further refine and validate your idea. A well thought out application is always one that is more palatable for developers and investors. Look for local meetups and matchmaking sites to help connect you with co-founder potentials. There you have it! You have a list of things to do to get your application development project off the ground. Let’s get to work! We would love to help you execute your idea when you’re ready to go. Contact Gravit-e for your startup needs! Blockchain: What is it and How is Canada Embracing It?